MUTANTs around the world have been asking us to create a whey protein isolate shake — and we listened. Formulated with high quality ingredients, MUTANT ISO SURGE is our NEW fast-acting Whey Protein Isolate & Hydrolysate formula with sinfully delicious flavours. We invested huge amounts of time and care crafting these flavours in our lab with MUTANT athletes involved in the taste-testing process! We're now ready to share these exciting flavours with you. A surge of protein plus a surge of flavour — that's the ISO SURGE one two advantage...pure and simple. 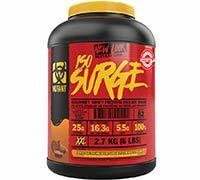 We're confident that ISO SURGE will be your go-to choice for all your whey isolate needs. ENJOY THE SURGE!